A relative of the more famous red ginseng, Eleuthero has been used in TCM since 190 A.D. It was dispensed in Europe to prevent colds and other viral infections, and used as a treatment for radiation exposure after the Chernobyl accident. Eleuthero Root is known to reduce fatigue and build stamina while stimulating the immune system against the effects of stress. It is said to support the body's resistance to infection during prolonged periods of physical and mental stress, and athletes use it to increase performance and endurance, favor its stamina-building benefits. Long used as a sedative, Eleuthero Root's stress-fighting capacities have been useful in combating depression, Attention Deficit Disorder (ADD), problems with concentration and environmental sensitivity. In men, Eleuthero Root appears to stimulate the body's production of testosterone and thus may be helpful in fighting impotence. It is used to increase longevity, stamina and boost the immune system. Eleuthero helps the body address stress. And scientists believe it helps prevent adrenal burnout caused by ongoing physical or mental challenges. Eleuthero boosts memory, focus, and concentration without the letdown that comes from drinking coffee or other sources of caffeine. This Ginseng can be taken by male and female for long periods of time. It has been used for mental and/or physical fatigue, curbs irritability, improves appetite, sleep and reflex action. The stress-fighting and depression-combating capacities in Eleuthero Root have also made it useful in the treatment of Attention Deficit Disorder (ADD). Eleuthero has been used traditionally for restoring memory, concentration and mental clarity, which may be impaired by poor blood supply to the brain. Eleuthero Root has been thought to ease depression by directly balancing serotonin, dopamine, epinephrine and norepinephrine, the brain chemicals that determine mood. Eleuthero protects against the dangers of radiation (atomic fallout, microwaves, and x-rays) and detoxifies the blood. It has also been used for adrenals, blood pressure, hemorrhaging, hyperglycemia, impotence, and memory. Eleuthero Root has been known to support the body by helping the liver detoxify harmful toxins and products of radiation exposure. Preliminary studies in Russia have confirmed the use of the herb for people undergoing chemotherapy and radiation treatments to help alleviate side effects. In human studies, the herb has been successfully used to treat bone marrow suppression caused by chemotherapy or radiation. Research claims that Eleuthero Root increases the synthesis of interferon, a powerful chemical that boosts immune system activity, interfering with every stage of viral infection. Healthy people taking the tincture three times daily have shown increased numbers of the immune cells that have been decreased during HIV-infections and AIDS and is believed to fight against every viral infection known to man. Eleuthero Root is thought to combat respiratory infections and has been used to treat bronchitis and chronic lung ailments. It has been used in Traditional Chinese Medicine to treat rheumatic diseases and heart ailments. The herb has been employed to reduce cholesterol, blood pressure and restore cardiovascular health. Eleuthero Root may also be useful when the HPA (hypothalamic-pituitary-adrenal axis) is depleted, symptoms of which include fatigue, stress, neurasthenia and sore muscles associated with the hypofunction of the endocrine system. Chinese healers believe that Eleuthero Root is one of the best remedies for insomnia. Russian athletes have been using Eleuthero Root for years for consistent training, quicker reflexes, better stamina and increased energy. It is favored by many athletes, who maintain that it prevents them from getting sick and becoming run down through heavy training and will actually improve an athlete’s overall training, promote more consistent training, quicken reflexes and lower race times. Eleuthero is used to reduce “burn” after workouts. It is said to resist stress and during a stressful situation, the adrenal glands release corticosteroids and adrenaline, which initiate the “fight-or-flight” response. When these hormones are depleted, the body reaches an exhausted phase, but the herb delays the exhausted phase and allows a more efficient release of the hormones. Nutrients: Calcium, choline, copper, fiber, folate, iron, magnesium, manganese, phosphorus, potassium, selenium, silicon, zinc, vitamins A, B1, B2, B3, B5, C, E and G.
Ingredients: Eleutherococcus senticosus, Structured Water, 20% Alcohol. Non-Alcohol: Eleutherococcus senticosus, Structured Water, and Vegetable Glycerin. Instructions: Use 6-12 drops in juice or water, under the tongue, or as desired. May be taken 3 times daily. Shake well. Store in cool, dark place. Keep out of reach of children. Contraindications: Men with prostate disorders should not use Eleuthero Root, as it contains compounds that may stimulate testosterone production. Pregnant and nursing women may use it but should avoid products that also contain Panax ginseng. Anyone taking digoxin (Lanoxicaps, Lanoxin) should seek the advice of a health-care professional before taking Eleuthero Root. Patients with hypertension should not consume Siberian Ginseng. Rare side effects have been reported: Insomnia, drowsiness, nervousness, tachycardia, headache, hypoglycemia. Hypoglycemics should use caution, as ginseng lowers blood sugar levels. 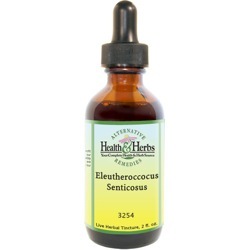 People with high blood pressure should consult their doctor before taking Eleutherococcus. May cause light sleep in some people. Users are recommended not to take it in the evening. Do not take if you have heart disease or high blood pressure.